Purpose: Remove limescale deposits, caused by magnesium and calcium, from the internal workings of the espresso machine. Please note that with respect to the boiler descaling, this process, to keep it simple, will only descale to the water refill line inside the boiler. It will not descale above it, nor will it descale the pressurstat. Machine identity: These instructions are provided for descaling a traditional espresso machine with water reservoir. If your machine has a direct water connection, you will need to shut off the water supply, and disconnect and place the intake water line to a container of solution. You must watch that the pump is sucking in solution by watching the level of solution go down. If it does not, then the machine has to be sent in for service. At the point you start the RINSING, you can re-connect to a water line. In addition, on direct water connect machines with a rotary vane pump, you do not have to wait for a cool down for the pump. Your espresso machine must have a single internal boiler that provides both water for espresso extraction and a second boiler for steam/hot water availability through two separate wands. The machine can be a PID or a non-PID two boiler system. Requirements before you start: hot espresso machine in power off position and plugged into outlet, descaling product, mixing container/pitcher, two (2) 12 ounce or larger containers for hot solution, one (1) 6 ounce or larger container for hot solution, and fresh water. You may need to solution than more than one full reservoir in your machine. Remove any water treatment devices (ie water softener, osmotic pack, etc) from the reservoir or intake hose. Follow instructions on descaler product to acquire proper solution ratio as most descalers require a mixture with water into a mixing container/pitcher. 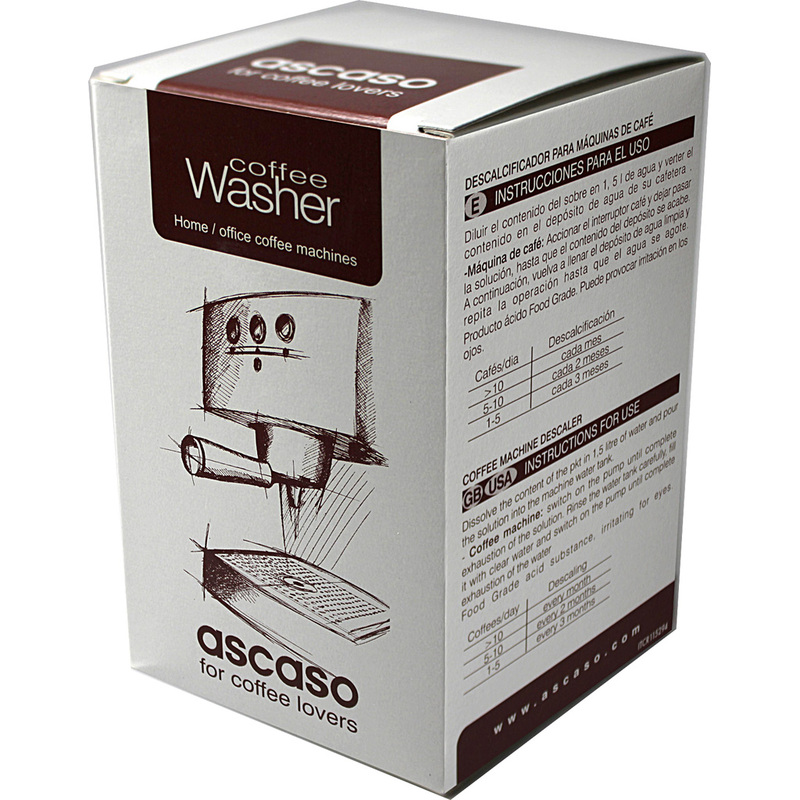 We sell Ascaso Coffee Washer for descaling. Pour descaling solution into water reservoir (or on direct connect machines, pour into a large separate container). Make sure not to get any solution on any of the machine finish as it can ruin it permanently. If you do, completely wipe the solution off with a damp terry cloth. Place one 6 oz or larger cup under the grouphead with a portafilter attached to the grouphead. Press the power switch to ‘on’ and turn on both boilers. Activate the machine to get solution through the grouphead. You should get about enough solution equivalent to the coffee boiler size of your machine. This will fill the entire boiler with solution. Stop and allow machine to fully warm up. On a direct water connect machine, you must watch that the pump is sucking in solution by watching the level of solution go down. If it does not, then the machine has to be sent in for service. Open hot water wand valve knob or depress hot water switch to full open position. Let about 4 ounces of hot water to escape, then close valve knob until you hear refill pump stop. Then repeat until you have displaced approximately one-half of your steam boiler. Please keep in mind that your steam boiler is only usually half full. OPTIONAL: With the machine cold, you can opt to perform a full steam boiler descaling, but this is out of the scope of this instruction included here. The boiler refill wire like described in the HX manual can be followed to fill the steam boiler in its entirety. However, you run the risk of water leakage. Let machine sit heated for 20-30 minutes so the solution descales the internal parts of the machine. Actiavte the grouphead so that all remaining solution in the reservoir passes through the grouphead. Empty container as it nears fill point. Remove reservoir, dispose of any remaining solution , and thoroughly rinse reservoir. On a direct water connect machine, this is the point you can re-connect the intake water hose to the water line, open the water line valve, check for leaks, then proceed. Wipe water reservoir hose(s) on machine with a wet terrycloth. Refill reservoir with fresh water and place back into machine. Let about 4 ounces of hot water to escape, then close valve knob until you hear refill pump stop. Then repeat until you have displaced approximately two times the size of your steam boiler. For example, if the steam boiler is 1.5 liters, you should dispalce about 3 liters of freshwater. Activate the machine to get solution through the grouphead. You should get about enough solution equivalent to two times the coffee boiler size of your machine. For example, if your machines has a 1.5 liter coffee boiler, you should run about 3 liters of water through the grouphead. HOWEVER, you can not run this all at once as most tank models need a cool down period for the vibration pump. For every minute you run the pump active, you should give it a two (2) minute rest period. This is to avoid damage to the pump. The machine has successfully been descaled.